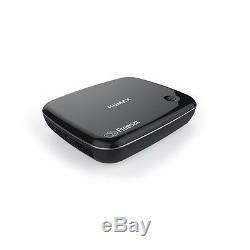 Humax HB1100S Freesat HD Set Top Box with Ethernet - Black. TV & Entertainment > Digital & Smart TV > Set top boxes. Top features: - Access over 200 TV and radio channels to enhance your home entertainment - Seven day catch-up TV services ensure you never miss your favourite shows - 13 high definition channels deliver detailed and immersive visuals Access over 200 TV and radio channels The Humax HB-1100S Freesat+ HD Smart Set Top Box offers you access to over 200 TV and radio channels. Since you don't need to pay for a subscription, you can enjoy free access to a wide range of entertainment with ease. Seven day catch-up TV services Using the built-in WiFi or Ethernet connection of the HB-1100S , you can enjoy access to catch up TV services such as BBC iPlayer and All 4. Search through the last seven days to find your favourite shows, ensuring that you never miss the entertainment you love. You can also stream films and boxsets using Netflix and watch your favourite online videos on YouTube. 13 high definition channels Offering access to 13 high definition channels, the HB-1100S delivers detailed and immersive visuals. For even more viewing options, you can connect an external USB device to view your favourite pictures and videos. Want a fantastic choice in TV, without paying a penny in subscriptions? With the Humax HB1100S Freesat set-top-box you can enjoy loads of great channels, and a huge range of catch up services, all subscription free. Well, using a satellite dish, with our Freesat HB1100S you can tune in to over 200+ digital channels. It gets even better, because you can also watch channels in stunning HD picture quality. S something for you to watch. Roll back across 26 channels to catch up with great shows you? Ve missed from the past 7 days. S not all, access BBC iPlayer, ITV Hub, All 4 and Demand 5 from the home menu. If you want a little extra, binge on hours of great content courtesy of Netflix, Wuaki, Hopster, Curzon Home Cinema, and YouTube. So simple to set up - now with built in Wi-Fi making it easier to connect to your home network. Ll be up and running in no time, with no lengthy cables to worry about either. With the Humax HB-1100S you can:? Catch up on the last 7 day? S worth of TV from within the guide? Watch subscription free satellite TV including HD channels? Select your TV Choice via the Now and Next screen? Access hundreds of programmes via on-demand ITV Hub is available in England, Wales & The Channel Islands. STV Player now available in Scotland. On Demand services require a compatible Freesat box and broadband connection. (minimum recommended speed 2 Mbps). All Currys/PC World Outlet guarantees are non-transferable. BBC iPlayer / ITV Player / All 4 / My5. Audio Output : DIGITAL, OPTICAL AND ANALOGUE. Connections : AV ETHERNET PORT, HDMI, USB. Freeview or Freesat : Freesat HD. Integrated Wifi : Yes Integrated Wifi. Smart TV Services : Netflix, BBC iPlayer, ITV Hub, All 4, My5, Wuaki, Curzon Home Cinema, Hopster, YouTube. This product has no reviews yet, however see what our buyers say about our other products..
We don't post to Channel Islands or Internationally. Warehouse/store pick-ups are not available. For more information, read on.. Courier selection is standard and will depend upon value and/or weight/dimensions of the product. Express: DPD - for safe, secure, signed-for deliveries to your door. This includes Northern Ireland and the Isle of Man. We do not accept orders to PO Box addresses and International orders, including those from the Republic of Ireland, the Scottish Highlands and the Channel Islands. Orders for large domestic appliances are accepted to all mainland UK addresses (including Northern Ireland) and the following islands: Isle of Skye, Isle of Sheppey, Anglesey, the Isle of Wight, and the Isle of Man. This excludes the Channel Islands and BFPO. To create your return label. Unopened - in an as new condition - unused, without installation or data input - in the same condition as supplied to you - complete with any accessories and free gifts offered with it - with the original box and unopened packaging. Unwanted products cannot be accepted after 30 days if any of the above criteria are not met. The right of cancellation does not apply in the following circumstances. When the product seal has been broken on any DVDs, CDs, memory cards or software, including games - On any personal hygiene products such as shavers, hair care products - On headphones, where the seal on the packaging is broken - If you want to return a Software Product Activation Key card which is not faulty, the silver strip on the back of the card must be fully intact as new. Complete the Reason for Return note that came with your parcel & include it in the parcel with your return. Take your parcel into any Post Office. To find your nearest Post Office. Remember to ask for a proof of return receipt from your Post Office as this will act as proof of posting should the parcel go astray. Failure to obtain this may prevent us from refunding you if your return is not received by us. Your return can be tracked using the tracking reference from your proof of return receipt by clicking Track My Return. In the same condition as supplied to you - complete with any accessories and free gifts offered with it - if possible, with the original box and packaging. The above warranties do not cover non-faulty products, nor issues caused by accident, neglect, misuse or normal wear and tear. Please note - we do not stock spare parts, and are unable to send replacement parts. You received an incorrect item - you received a damaged item - you received a faulty item. Can a Currys or PC World retail store help? Reassuring 12 month guarantee on all products. The item "Humax HB1100S Freesat HD Set Top Box with Ethernet Black" is in sale since Thursday, April 27, 2017. This item is in the category "Sound & Vision\TV Reception & Set-Top Boxes\Satellite TV Receivers".